Screening services comprise a variety of technological and human solutions aimed at improving the detection and prevention of threats before they manifest themselves. We provide security screening of employees and materials as part of your overall security plan or as a temporary security measure when the need arises. 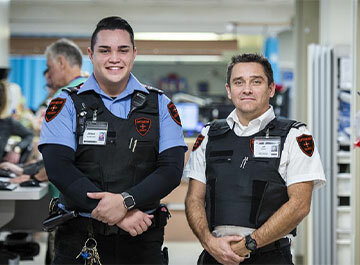 As one of the leading security solutions providers in Alberta, Ontario and British Columbia, we are uniquely positioned to deliver personalized security screening services for clients across both the private and public sectors. Our highly trained and certified agents employ integrated security systems to scan and assess employees, visitors, vehicles, packages and freight before entering or leaving the building or premises. With a combination of technology systems that can be adapted to detect contraband, weapons, and company property, as well as highly trained and experienced security officers who can use various techniques to locate items hidden in clothing, bags and compartments, you can have peace of mind knowing that anything that has not been sanctioned will not get past your security guards. WHEN DO YOU NEED SECURITY SCREENING SOLUTIONS? We provide employee screening services for corporations that require meticulous access control. Our trained security officers use technical equipment to search and assess people entering the premises, as well as the items they are carrying. This can be done on a daily basis. However, there are some instances when a temporary security solution is needed, in which case we provide the needed extra security checks for a set period. This may include occasions such as corporate events or conferences that require greater protection because the guests or speakers may evoke strong feelings. Some organizations have mixed feelings about the screening procedure, arguing that it may inconvenience visitors in terms of process and scrutiny. However, boosting the security of your organization by stationing uniformed security guards at the entrances with handheld metal detectors, walk-through metal detectors or X-rays will actually give the employees and guests peace of mind because the process drastically reduces potential threats. Our security experts identify ways to utilise the most suitable screening equipment that fits into your overall security footprint. We work to improve the security of your building or premises without the inconvenience of long checkpoint lines. In this regard, our corporate screening services take into consideration three main points. Throughput: An assessment of how fast people can move through the checkpoint. The faster the throughput, the shorter the queues, and the happier your employees and visitors will be. Faster moving lines do not necessarily translate to compromised security. Flexibility: We assess the ability to scale up and down depending on changes to security needs. Our screening systems are easy to both install and to calibrate for quicker response. Support: The screening service is usually part of a larger integrated security system. We may be in total control of all security aspects, or work with existing security systems to ensure consistency in handling different threats. Optimum Security offers cost-effective, leading-edge corporate screening solutions that are scalable to suit the changing regulatory environment and client needs, while exercising firm compliance with industry and legal standards. Contact us today to learn more about what we can do for you.
" We contracted Optimum Security at very short notice to undertake manned guarding at a high security site under development. The proactive nature of the company’s management, and their dedication to provide rapid and continual services, was beyond our expectations.	" " We have found Optimum Security to be an extremely efficient and well organized company; their operatives are experienced and professional whilst also being polite and well-mannered.. We have found that service to be exemplary.	" " I have found Optimum Security to be a very customer focused company, both in their dealings with us and our third party customers.	" " We contacted Optimum Security at short notice and had to make various changes to our security requirement over the course of the contract.	" " You and your team have saved the day….again! Thank you for your continued support for our coverage in BC. It is a busy time of year for everyone and I know staff are spread thin.	"